When the Archibald Prize opens to the public tomorrow, Sydney College of the Arts graduand Bin Xie’s portrait of artist and SCA senior lecturer Lindy Lee will be hanging with the other finalists - no mean feat for someone who started painting seriously only four years ago. Bin Xie's Bright Smile, 2005, hanging in the 2006 Archibald Prize. “I was very surprised because I’ve a very short history in art,” said Bin Xie who taught university mathematics at Chongqing University in China before migrating to Australia in 1990. After working in several jobs - including some part-time maths tutoring at Sydney university - she completed a fine arts diploma at Meadowbank TAFE in 2003, then embarked on a Master of Studio Arts at SCA, from which she’ll graduate in April. 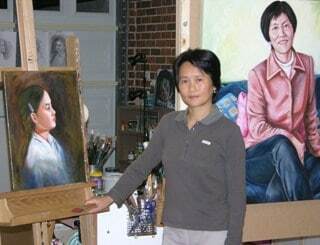 Bin Xie in her studio with her portraits of her daughter Cecelia (left) and Chinese School principal, Xu Yi. 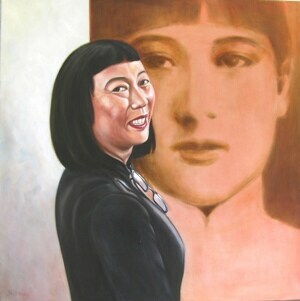 The portrait, Bright Smile, is from a series of ten Ms Xie painted for the major project of her master’s degree, celebrating the achievements of Australian women of Chinese descent. The portrait incorporates an image Lindy Lee has used in her own work, that of her mother at the age of fourteen, which made a big impression on Xie when she first saw an exhibition of Lee’s work three years ago. A year or two later she saw the image in Lindy Lee’s portrait of her mother flying high on banners down George Street as part of the arts festival, Art and About. “So when I painted Lindy I wanted to put her mother’s portrait in the background and she agreed. Two generations of Chinese women so different." Ms Xie has also painted still lifes, two of which were purchased last year by the University’s Centre for Continuing Education. But she intends to keep painting portraits and aims to paint more people from China as well as people of other cultures, she said. Flying high outside the gallery - an image from Xie's portrait of Lee (left). Humble about her portrait’s selection for this year’s Archibald, Ms Xie insists it’s not just a personal success. “I think it’s also the University’s success and SCA teachers’ success because, really, Lindy and the other teachers gave me lots of help in terms of ideas and advice,” she said. In another echo of Lindy Lee and her work, images of Bin Xie’s portrait of Lee will also fly from banners in the streets of Sydney during the Archibald Prize exhibition which continues at the Art Gallery of NSW until 28 May. Media enquiries: 9351 2261 or 0423 782 603.